Teaching Art | Creative Kids Have Fun! Art Programs Designed by Pamela Atkinson for Students, Kindergarten through 8th grade. I’ve been known to find artwork from a few years ago and not remember making it. Looking at it, I wonder why I didn’t value it more. Could the answer be that I wasn’t ready to accept the direction it was taking my work? Was I so involved with my current thoughts that I didn’t want the distraction of a new concept? Making a painting is like going on a long trip; what you discover along the way can surprise and delight, and sometimes dismay, but it’s always exciting, and in the end it’s worth all the effort and that’s why I paint. I’ve read many books that say you need to plan the composition and value placement so that your work looks cohesive, and as a teacher I believe this. But if I follow this advise it leads to stale looking work; stiff and lifeless. I’ve planned paintings in this way and the work was successful but the painter was bored! Where were the surprises and what about the mystery? The adventurous way, and my preferred way of working, is to see where the process takes me. It’s my belief, that since my paintings come from my thoughts there is a built-in harmony between my various artworks. But I know that to pull this off you need good solid knowledge of art making techniques and time spent experimenting with different materials. Art history is crucial, it teaches you to appreciate what you’re seeing and the people who have come before you. Without all of this you are flailing around with a paintbrush in your hand. I hope you enjoy my newest painting (above) and that it speaks clearly to all who patiently look. It represents energy in it’s raw form becoming something beautiful and strong. It takes determination and patience to create a painting but the final work is well worth the journey. I’m always curious about other artist’s creative processes. Please write a comment about your artwork and include a link to your site! This entry was posted in Visual Artist, Painter and tagged Abstract, acrylic paint, Acrylic Painting, CA, Energy, Floral, Flowers, https://www.etsy.com/shop/PamelaAtkinsonArt, Pam Atkinson, Pamela Atkinson, pamelaatkinson.net, pamelaatkinsonart.com, Riverside, Southern California, Teaching Art, Visual Artist on May 15, 2015 by Pamela Atkinson. Self Portraits, created by students from Saint Francis de Sales Elementary, 2013/14 school year. For the last few years, I’ve been teaching art at two different schools. Getting to know the kids over a period of time has its advantages. I appreciate Sally’s beautiful line drawings and Thunder’s colorful and bold designs and it’s easy to guide students to a deeper understanding of art making when you know them and how they approach an assignment. I’m delighted to see all the kid’s skills develop and that moment, around the 4th grade when those who were struggling to understand observational drawing finally grasp how it works, makes me as happy as it does them. Most of my students apply what I teach them and build on previous lessons, and because of this, their artwork is confident and inventive. This year, I’ve added a new school to the mix. I’m working with the 4th to 8th grades and any nerves I felt at meeting the kids were soon forgotten. Most of them were enthusiastic and extremely polite and my first day went by in a flash. The students seemed happy to have the opportunity to draw but there are those few worried students that I hope to reach. They were too well-behaved to groan outwardly, but wrapping their arms around their paper to shield it from my view is a sure sign of discomfort and one student erased his whole drawing as the rest of the class was turning in their work. My drawing pencils and I caused some kids to want to be anywhere but in there seats. Art is a funny thing, most people think you’re either born with the ability to create or you’re not. That everything an artists makes is easy to do and looks amazing when completed. If this were true, the world would be a much more visually exciting place. But art making requires knowledge, thought, ability, perseverance, and the courage to evaluate what you’ve created and make changes when necessary, all skills I try to convey to young artists. I want all of my students to learn and have a wonderful experience, but most of all I want the worried kids to know that it’s not about being the best, it’s about enjoying the process. Check out http://creativekidshavefun.com to learn more about our programs and to view our student’s work. This entry was posted in Painter, Visual Artist and tagged creative, Creative Kids Have Fun, creativekidshavefun.com, Pam Atkinson, Pamela Atkinson, Saint Francis de Sales Elementary, Sofia Atmatzidou-Eulgem, Student Work, students, Teaching Art, Visual Artist, Visual Arts on October 14, 2014 by Pamela Atkinson. It is with great sadness that I write this post, one of my painting students passed away last week. About twelve years ago, I received a call from a woman who wanted to come to my watercolor/acrylic painting class and paint with oils. I said no. I explained that I hadn’t used oil paints since high school and wouldn’t be able to help her. She came anyway! And boy am I glad she did! If she’d listened to me I would have missed meeting a generous, thoughtful, sensitive woman, who spoke her mind without apology. Classes come and go, and I was no longer teaching adults when I got another call. Could I come and work with a small group in her home studio? Of course I said yes, and three years ago I began what her son called “Tuesdays with Laurie.” Laurie referred to the group as the “Golden Girls,” three unforgettable women, all with different painting styles, and all dedicated to supporting each others efforts. Laurie painted places she had visited and cared about; pictures with meaning and memories. She appeared to have no angst or fear about starting a new painting and worked to make each canvas the best it could be, even reworking paintings she had done in the past to get them just right. She was always on the look out for inspiration and loved the look of laundry hanging on a line. When you work with people over a period of time you get to know them; where they grew up, the places they’ve lived, the people they love, and how they feel about life. I’m lucky to have gotten to know Laurie. She was irrepressible. I will always remember her joy, laughter, and curiosity. Laurie Chamberlain, you will be missed and I will remember all you taught me! This entry was posted in Visual Artist, Painter and tagged Acrylic Painting, Friendship, Laurie Chamberlain, Oil paints, Painter, Painting, Pam Atkinson, Private Lessons, Teaching Art, Watercolor on July 24, 2014 by Pamela Atkinson. Lush, vibrant, bold pigments; a tube of paint is magic! 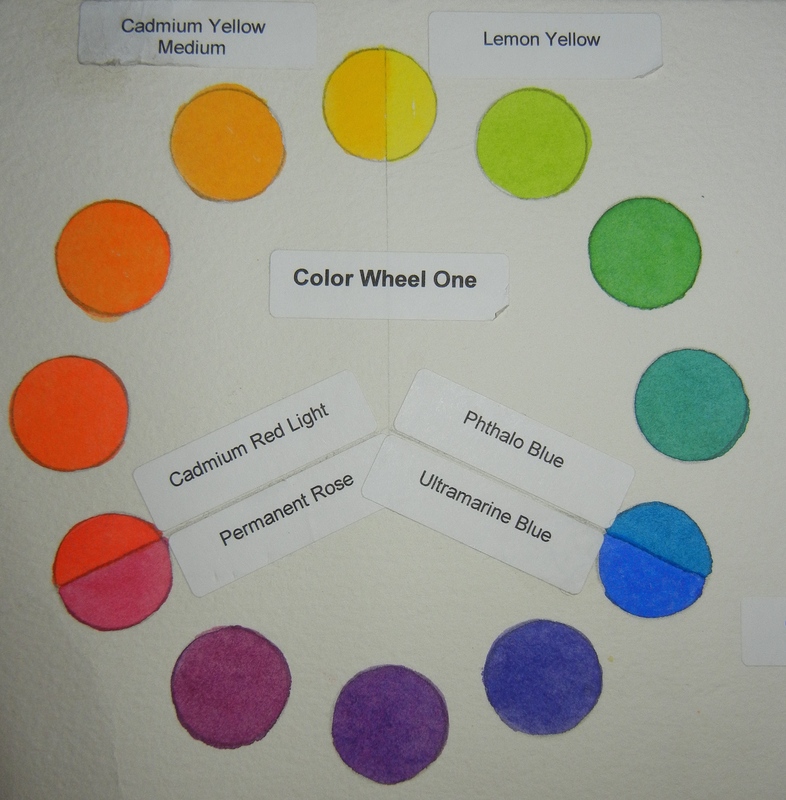 But, when I’m teaching, I like my students to use a limited palette of six colors, (see the color wheel to the right). If they’re using acrylics, they also need white and if they’re really, really insistent, black. I don’t use black in my work because I like the challenge of mixing rich, deep colors. To deepen the value of a hue I use its complement (the opposite color on the color wheel; yellow and violet, red and Green, and orange and blue). The more complex the color the better! 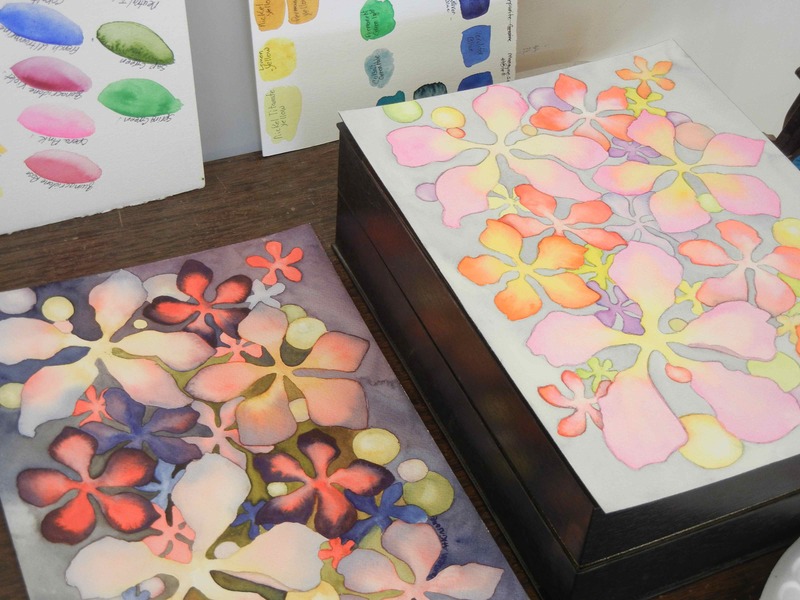 When I created most of my early watercolors (see painting on the left), I used only four tubes of paint; Cadmium Yellow Medium, Permanent Rose, Ultramarine Blue, and Sap Green. The work I made with this color scheme had unity and a distinctive look and sometimes I still use them. But I don’t like rules in art and new colors delights me, so lately, I’ve been having fun using the watercolor triad sets sold by Daniel Smith. The Reflections Triad* came today. I’ll mix and match these paints with colors I already own. I’ll keep the selection to 4 or 5 pigments per painting and make sure I have a clear bright hue in the mix. I can’t wait to try the Blue Apatite Genuine and I’ll be sure to post the results. Do you have a favorite paint color? I’d love to hear your comments. *Update, Daniel Smith now sells only the primary and secondary triad set. Still a great deal, you can check them out at Daniel Smith sets. This entry was posted in Visual Artist, Painter and tagged Acrylic, Cadmium Yellow Medium, Color Mixing, color wheel, Daniel Smith, Floral, Flowers, paint color, Painting, Pam Atkinson, Pamela Atkinson, Permanent Rose, Teaching Art, Tulips, Ultramarine Blue, Vibrant, Watercolor, Watercolor Triads on June 8, 2014 by Pamela Atkinson. Two of my watercolors, “Moon Moss #2” and “Moon Moss #4,” and color charts, Pamela Atkinson, ©2015. The decision to write a blog was not an easy one for me. My internal critic knows many reasons why this is a bad idea and will articulate them ad nauseam. And yet, I’ve decided to ignore the doubts and excuses; what will I say each week? Who will want to read it? You’re not a writer, you’re a painter, etc. etc. I could go on and on, but I love art and sharing my enthusiasm for color and paint has won out. So, here I am writing my first post. Starting at the beginning seems like a good idea. 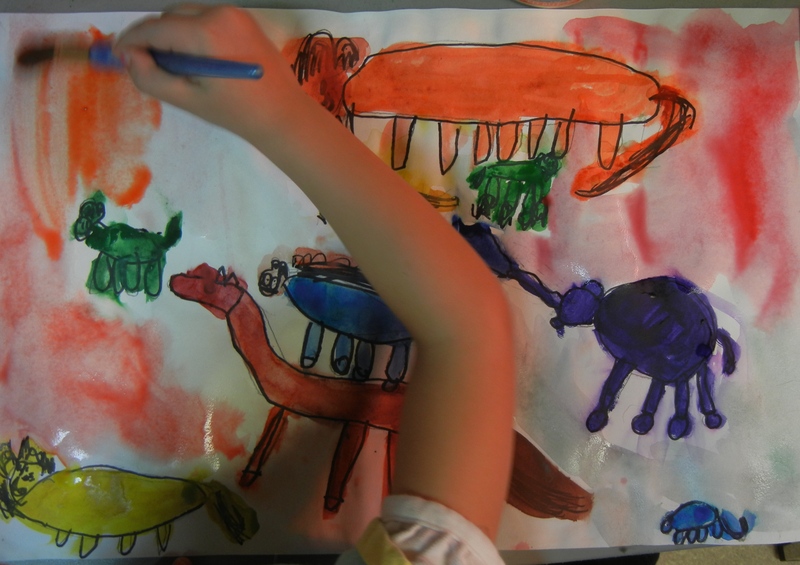 One of my preschool students painting a wonderful animal picture. I have been a painter since my parents gave me my first set of Prang watercolors. They came in a metal box and I thought they were magic! Just add water and a brush and amazing things happen. With the stroke of your hand, you can create a line and turn it into a dog by adding a circle and four small lines. One color blends into another. The shape that starts out yellow turns into a big brown puddle when purple is added. The paintings take forever to dry and all you want to do is show them off to anyone who will look! Almost as exciting is cleaning your brush; plunging it into clean water and watching rings of color form and dissipate into a murky pool is all part of the fun. Because I work with small children, as well as teens and adults, I have shared these magical first attempts at painting again and again. Putting down on paper the elusive images in your head is both joyous and frustrating. Please share your first memories of making art in the comments section. This entry was posted in Visual Artist, Painter and tagged Abstract, Acrylic, CA, Flowers, Painting, Pam Atkinson, Riverside, Teaching Art, Visual Arts, Watercolor on May 14, 2014 by Pamela Atkinson.